Not all historical markers are carved in cold stone or forged in metal. 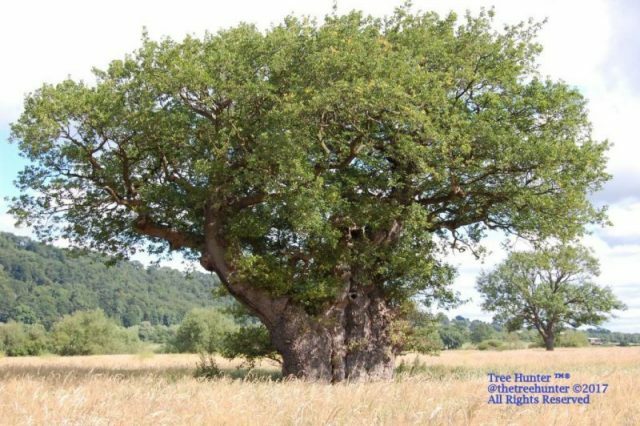 Until recently, one of the largest–the Buttington Oak in Wales–was a massive living presence of wood, leaf, twig, and bark. It was 1,000 years old and had been planted on Offa’s Dyke, an ancient raised earthwork that was built along the border between Wales and England. Historians believe the tree was planted to mark the Battle of Buttington and as a boundary marker on the dyke. The Battle of Buttington was fought in 893 and involved an alliance of Anglo-Saxons and Welsh, who pulled together to send a large force of Vikings packing. It was clear the Vikings had come with the intention of settling. They had brought women and children with them, and it took weeks of siege against their fortifications to finally rout them. 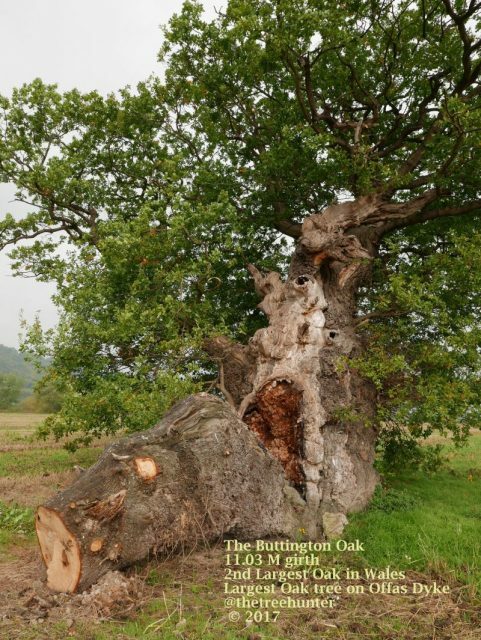 The Buttington Oak thrived in the spot, and evidence it had been regularly pollarded over the centuries shows it was a valuable resource, providing timber to the local community. 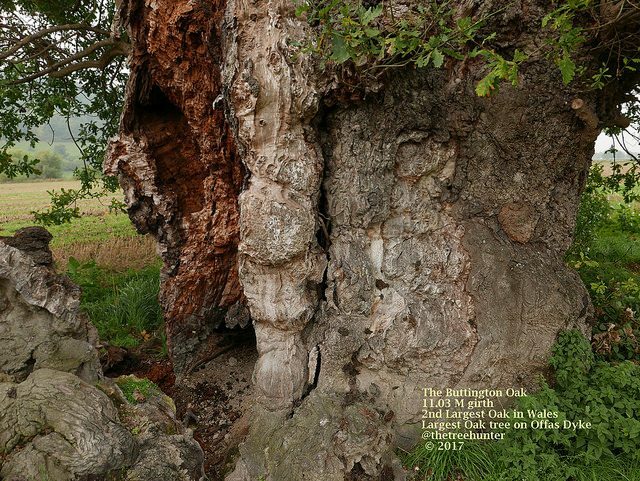 It grew to be the biggest tree on Offa’s Dyke and the second biggest oak in all of Wales. 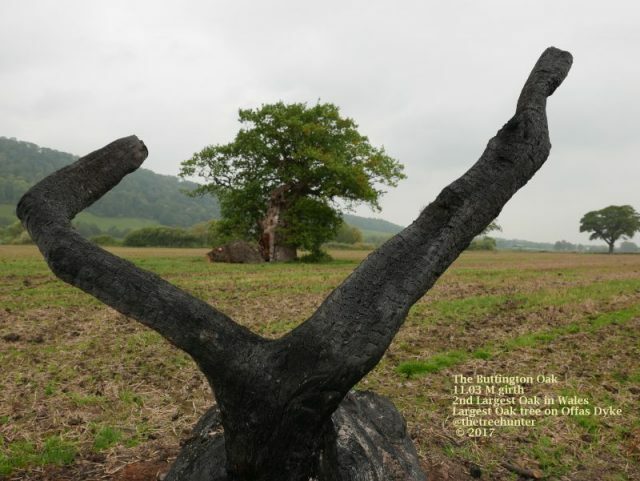 The Buttington Oak was always a fixture to the locals, but it was rediscovered by the outside world as a noteworthy tree of size and significance in 2009. 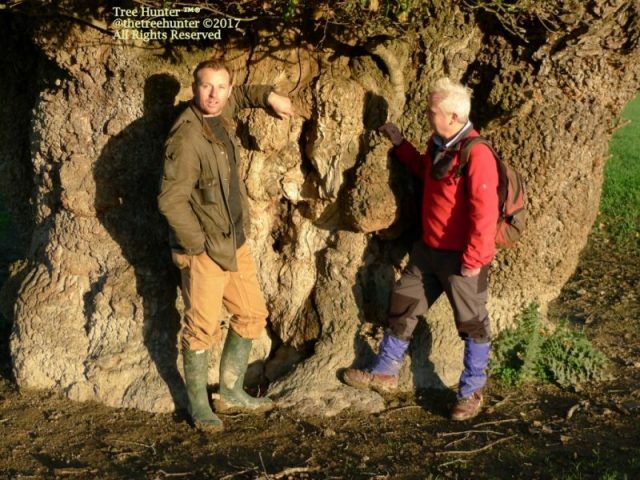 It was 36 feet in girth, growing in a floodplain east of the River Severn. A woman who worked to find and record important heritage trees had to wade across the river to get to it. The Woodland Trust, the United Kingdom’s largest forest conservation organization, called it an “iconic feature of the landscape.” But in 2017, the tree was badly damaged by a storm, and in February 2018, it gave way after 10 centuries of supporting itself and reminding residents what people can do when they work together. Rob McBride, who goes by the nickname the Tree Hunter, mourned its loss. “It had enormous cultural significance,” he told the Daily Express. McBride renewed his call for more protection for such trees after its collapse. In 2013, another important Welsh cultural icon, the Pontfadog Oak, toppled over, shocking people around the world. That tree had a massive, almost boulder-like trunk of 53 feet around. Estimated at between 1,200 and 1,600 years old, the tree was so big that a missing bull once spent two days in its hollow trunk before it was found, locals reported. It was considered a national treasure and had shaded some 40 generations of people. It took root centuries before most cathedrals were built and before the land on the other side of Offa’s Dyke was called England. When gale-force winds finally took it down, word spread quickly. Once the gathering rubberneckers left, the locals held a wake among themselves. “We raised a glass to it,” Dianne Coakley-Williams told The Guardian. Five generations of the Williams family have lived in the area, and their stories around the venerable tree had accumulated like moss in tangled roots. Sheep went there for shelter or to die. Victorians posed for early photos by it. Generations carved their initials and pictures on its sides. Local children searched for Easter eggs there. Like the Buttington Oak, the Pontfadog Oak was also a pollarded tree from which wood was regularly harvested. McBride said such trees have to be treated with special care because they are different from those that grew naturally. He added that the measures don’t have to be expensive. 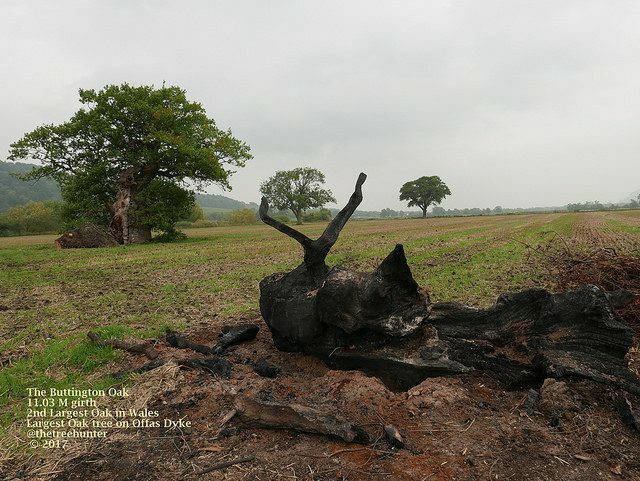 There are still old trees in the United Kingdom that could use some help. A database of ancient trees shows 80 percent of those in northern Europe are in the U.K. — England has nearly 5,400, with Scotland at 646 and Wales 581. Many are more than a half-century old. One old tree did get a life-saving intervention recently. 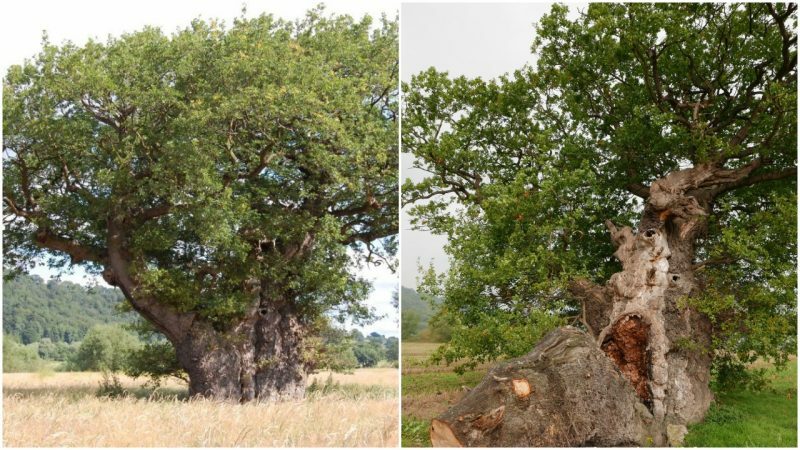 Wales’ Brimmon Oak would have been mowed down by a new bypass, but after a public outcry in 2016, the road’s path was diverted to keep the tree safe. Terri Likens‘ byline has appeared in newspapers around the world through The Associated Press. She has also done work for ABCNews, the BBC, and magazines that include High Country News, American Profile, and Plateau Journal. She lives just east of Nashville, Tenn.